On Running has made massive gains in the road running market thanks to the cushioning and energy return claims for its shoes. The Cloudventure is no different – you feel like you are springing over the trails and can happily mix in a bit of road running if needed. The 6mm drop means there’s surprisingly good stability over looser, more technical ground, giving you the confidence to run at speed. 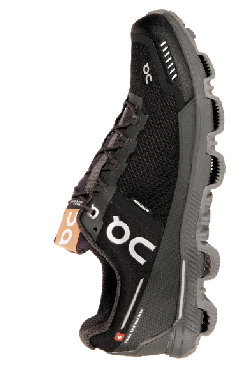 The grip is OK, but the nature of the outsole means the number of lugs in contact with the ground at any one time is limited, so not the best on wet rock or muddy trails. The laces are very thin and a pain to undo with cold hands. Verdict: Well-cushioned ride that makes you want to run fast.